Creating a telemedicine appointment type in Prime Suite can be done in 6 easy-to-follow steps! Hover over "Schedule" and click "Schedule Administration". 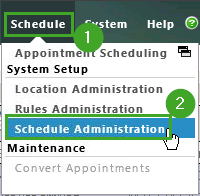 Click the "Appointment Types" tab, then click the "+" button. Enter Telemedicine as the "Appointment Type" and move all "Resource Categories" over. Tip: For other required fields, you can enter what you'd like. Click the "Appointment Categories" tab, then find the appropriate category to classify this visit. Then, find the Telemedicine appointment type and click the single ">" to bring the selection over. Tip: If there are no appropriate categories or to make a new one, click the "+" button.